The U.S. Environmental Protection Agency currently regulates more than 558,000 active underground storage tanks at an estimated 200,000 sites, and reports that 30 percent of tank owners and operators are deemed out of compliance. WHITEHOUSE STATION, N.J., Sept. 11, 2018 /PRNewswire/ -- Updated regulations from the U.S. Environmental Protection Agency (EPA) take effect October 13, 2018, resulting in more stringent requirements for the construction, installation, operation, maintenance, testing and reporting of underground storage tanks, as well as training for tank operators. A new Chubb whitepaper examines these increasing regulatory and compliance requirements, and the resulting challenges for underground storage tank owners and operators seeking to mitigate potential exposures. New federal regulations include provisions for more spill-resistant tanks and piping, more frequent inspection and testing, as well as more extensive training and record-keeping. As part of the current regulations, tank owners must also demonstrate a minimum of one million dollars in financial responsibility for any site with greater than 100 tanks or with an output of 10 thousand gallons per month. Additional regulations and requirements vary on a state-by-state basis, making compliance a more complex process for tank owners and operators. According to the EPA, the agency currently regulates more than 558,000 active underground storage tanks at an estimated 200,000 sites, and reports that 30 percent of tank owners and operators are deemed out of compliance. "Tank operators must pay greater attention to compliance as a result of the new requirements being put into place by the U.S. Environmental Protection Agency," said Bob Winterburn, Vice President, Chubb Environmental. "For these reasons, tank owners are purchasing insurance. In doing so, it is important for them to consider a comprehensive solution that engages best practices such as tank monitoring, operator training, risk mitigation, spill reporting technology and claims handling experience." "Smaller tank operators may be especially vulnerable if they lack risk management expertise. They may not have the financial resources or knowledge to adequately train their staff; maintain, monitor and register their tanks; or even properly report spills or leakages," Winterburn continued. "Chubb has helped companies of all sizes identify and fill potential coverage gaps and mitigate the risks associated with tank ownership and management for more than 15 years. Our TankSafe® portal provides customers with an easy and efficient way to secure commercial storage tank insurance." 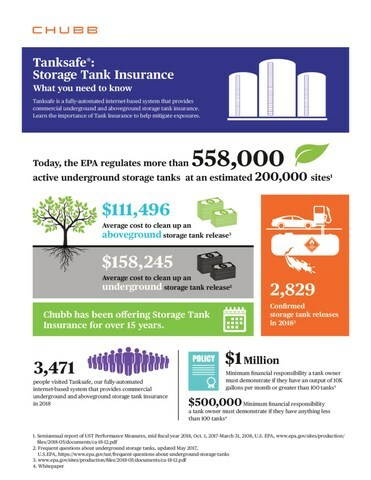 Chubb TankSafe is a fully-automated internet-based system for commercial underground and aboveground storage tank insurance. It is designed specifically to make an otherwise complicated process both user-friendly and efficient, from submission through policy and financial responsibility certificate issuance. It combines underground and aboveground storage tank coverage in a single policy and is provided on an admitted basis in both the U.S. and Canada to both retail and wholesale customers. To learn more about the new federal requirements and their impact on tank owners and operators, download the whitepaper here. For more information on Chubb's solutions, click here. Chubb is the world's largest publicly traded property and casualty insurance company, and the largest commercial insurer in the United States. With operations in 54 countries and territories, Chubb provides commercial and personal property and casualty insurance, personal accident and supplemental health insurance, reinsurance and life insurance to a diverse group of clients. As an underwriting company, we assess, assume and manage risk with insight and discipline. We service and pay our claims fairly and promptly. The company is also defined by its extensive product and service offerings, broad distribution capabilities, exceptional financial strength and local operations globally. Parent company Chubb Limited is listed on the New York Stock Exchange (NYSE: CB) and is a component of the S&P 500 index. Chubb maintains executive offices in Zurich, New York, London and other locations, and employs approximately 31,000 people worldwide. Additional information can be found at www.chubb.com.